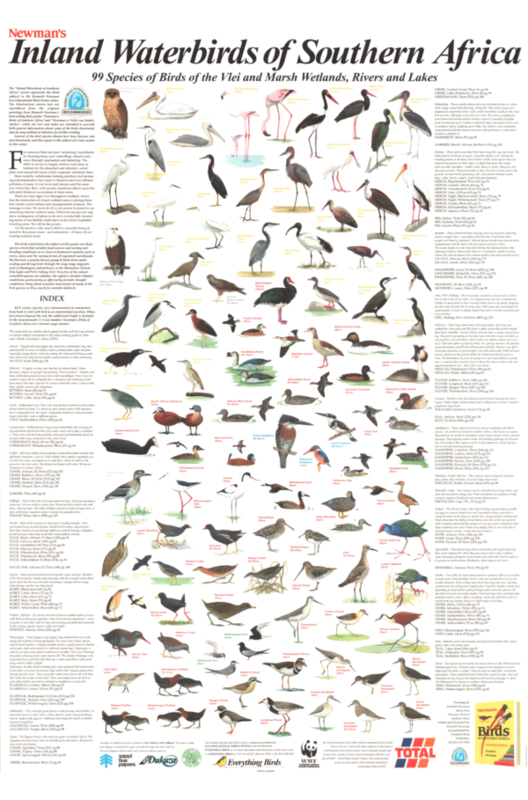 Represented on this poster are 99 species of inland waterbirds illustrated by Kenneth Newman. Among the bird families shown are: bittern, cormorant, crake, duck, egret, flamingo, flufftail, gallinule, goose, grebe, heron, ibis, jacana, kingfisher, moorhen, pelican, plover, sandpiper, snipe, stork, teal and tern. There are clear signs now through southern Africa that the destruction of inland wetland areas is placing those that remain under intense and unsupportable pressure. The message is clear. We must do all in our power to preserve our remaining natural wetland areas. Otherwise (as just one negative consequence of failure to do so) a wonderfully interesting sector of our birdlife could leave us for more hospitable breeding areas. We will be the poorer. On the positive side, much effort is currently being directed to the preservation – and restoration – of many of our existing wetland areas. “Inland Waterbirds of Southern Africa” is one of 36 beautifully illustrated nature posters produced by Korck Publishing, South Africa. The wall poster measures 860 mm x 594 mm (33.9 x 23.4 inches). The poster is double laminated (ie laminated both sides) for ultimate protection , and will be shipped to you in a sturdy postal tube. Many of our customers throughout the world choose to frame or blockmount the poster such is the quality and impact of the poster itself.